Fred has built his perfect den—but something’s missing. The toothy beaver with a red-plaid trapper hat has thought of everything: bunk beds, video games, a water slide, and a table for two. But something is not quite right. 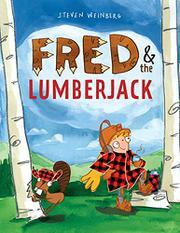 When a chainsaw-wielding, red-plaid-coat–wearing lumberjack roars into his life with power and precision, Fred realizes it’s not what he was missing but whom. Now if he can only impress the pale-skinned, blonde-tressed lumberjack girl without ruining everything….Weinberg’s energetic pencil, watercolor, and digital blend brings vigor and whimsy to this fairly straightforward friendship story. It offers humor and a bit of context to what is otherwise a brief but wildly melodramatic moment in the text (“FRED IS DOOMED!”). Fortunately for Fred, shared interests and contrition resolve the relatively thin conflict and result in more building and playing and planning together. Implications for and impacts on readers are likely minimal—one can’t help but think that this particular story might have resonated more deeply in a recently passed, more lumberjack-crazed cultural moment. Still, the endpapers reference the Catskills, where perhaps lumber-themed lore is always en vogue, so this one may find its readership yet.